The Old and the New: The Moorings before the structure's demolition. A new home was built on the property with the intention of removing the Moorings and it can be seen in the background. 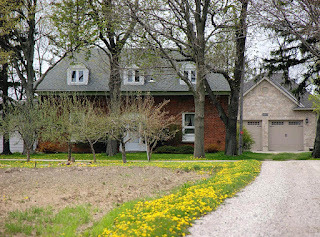 Although the building has been demolished, there is still an excellent story to be told and, in the bicentennial year for the War of 1812, it is one of Lambton County's most well-known connections to the war. 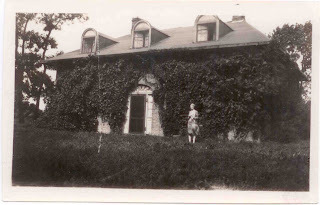 This blog will examine the history of the Moorings and the home's first owner, War of 1812 veteran Thomas Ledlie Crooke. Thomas Ledlie Crooke, who was colloquially referred to around the county as "Commodore Crooke," was born in 1793 in Port Arlington, Queens County, Ireland (just north of Cork.) He was well-known around the community and is described in Margaret Hill and Frances French's History of the Moorings as "an attractive gentleman, sporting red hair with deep blue eyes... Thomas was known as an intelligent, industrious, honest, generous and friendly man, who was highly regarded by all who knew him." He joined the Royal Navy on December 10, 1806, a traditional career move for third-born sons in Britain. He entered the Navy as a "First Class Volunteer," which according to Ron Dale, War of 1812 Project Manager with Parks Canada, "... was normally taken on board by an officer who was a friend of the family and would hope to do well as a 'boy,' possibly serving as the officer's servant and hoping to be appointed as a Midshipman when a vacancy occurred." During the War of 1812, he joined the Lake Ontario squadron under Admiral James Lucas Yeo on board the Prince Regent and then on the St. Lawrence. After the war ended he was "beached," meaning he was laid off but received a military pension with the understanding that he could be called back to work at any time. He returned to Ireland for some time, and in 1832 he was given a military land grant for 247.5 acres along the Lake Huron shore. He set sail from Ireland as a thirty-eight year old bachelor with his nineteen-year-old nephew Samuel Cantwell "Canty" Hill and landed in Port Sarnia on August 1, 1834. Another vintage photograph of the Moorings. Starting life in Canada's wilderness was taxing for early settlers. Crooke needed to clear his land, build a home and establish fields for farming. He envisioned building a grand stone house but hauling blocks of stone up the banks from boats on the lake proved to be an overwhelming task. After a stone foundation 43 feet long, 39 feet wide and 4 feet deep was built, Crooke opted for bricks to finish his home. He used the clay on his property and baked over 83,000 red clay bricks to complete the Moorings, which had walls four brick layers deep! The structure was intentionally built as strong as a fortress, strong enough to withstand a cannon ball if the Americans ever tried to invade Canada again. Crooke even took the trajectory of a cannon blast into consideration when deciding where to place the home on his property. Some of the most interesting features of the home's interior included an immense fireplace in the living room, a solid walnut banister along the stairway, and a huge door-lock with a brass key six inches in length. 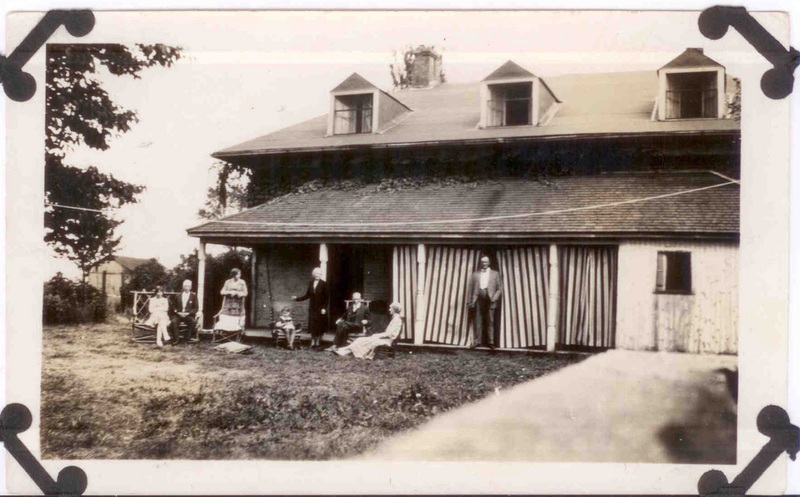 Overnight accommodations for up to nineteen people were readily available, which was fortunate for Crooke, who enjoyed entertaining and having visitors to in home. According to records of the Hillsboro Cemetery, "He enjoyed entertaining and felt insulted in a guest left before staying a week." The Moorings brushed with snow. He settled on Lot 49, lake shore, where he lived generally alone (he being a bachelor): but his genial manner and proverbial hospitality, coupled with his inimitable faculty of entertaining those of any and every taste, especially his amusing manner of relating an anecdote, drew around him such a number of friends as left him no time to become lonesome. There was however another very material inducement for people to visit his house - an inducement to which a greater charm attached in those days than at present - happily for the present. The 'magnet' referred to was a large barrel of whiskey, which is alleged to have been strictly first-class, and from this fountain of 'spirits' all were welcome to drink at any and all hours, as he always kept it on hand.